The Local Gardener magazines, Ontario Gardener, Manitoba Gardener and Alberta Gardener, are published by Pegasus Publications Inc.
1. Tall and red and young and lovely. Canna lilies are like a song in the garden. Although there are now dwarf varieties, the traditionally tall and stately plant has been gracing formal gardens for many years. Lately, lovely canna has made her way to the garden wearing a lot of new and not so traditional dresses. She comes in reds, yellows, oranges, pinks and even a combination of two or more of these colours. Leaves can be green, bronze or striped with cream. 2. Not just a pretty face. 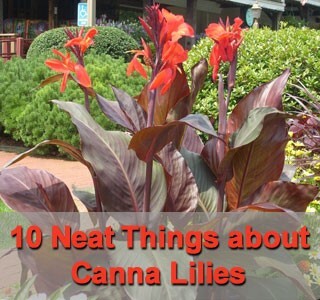 Canna is one of the most useful plants in the ornamental garden. A tropical native, she grows wild in South America as naturally as in India and Africa. She is completely edible from her starchy rhizomes to her large, hard-coated seeds. Stems and foliage have been used for animal fodder and to make a jute substitute, and the leaves can be used to make a tan-coloured paper. Seeds are employed as a tortilla additive, as beads in jewelry and in gourd rattles to make music. 3. Arrowroot to raksi to purple dye. The starch from canna is one of the sources of arrowroot, which is used in place of cornstarch or flour in tropical cuisine. Canna is said to be the plant richest in starch. Raksi is an alcoholic beverage made from canna root in Nepal. A beautiful purple dye can be obtained from the seeds. 4. Those are stamens, stupid! Canna flaunts its self-love openly. What we would consider its petals are really staminodes (sterile stamens) surrounding the anther and stamen which leads to the three-chambered ovary. Pollen is produced right next to the stigma for ease of self-pollination. The lower "petal" is actually the labellum or lip on which insects land. Pollen is shed on the style while the flower is still in bud. The closest relative to canna is ginger, which has all kinds of medicinal properties. But so has canna, according to those who rely on the plant for many things, including to treat fevers, diarrhea, dysentery, gonorrhea and tonsillitis, among dozens of other uses. The flowers are even used to treat eye ailments. In climate zones above 8, over time, canna will spread via its underground rhizomes into large clumps. If you want a big fat clump in your garden or container, look for rhizomes with many green bumps. These are the eyes from which new stems will emerge. They should be green and supple. Cannas are beloved by hummingbirds and also by bats and bees, all of whom augment the self-pollination ability of the flower. 8. Help me make it though the winter. Cannas are easily overwintered. They will bloom from spring right through to the first heavy frost, when the blackened leaves can be discarded and the rhizome lifted. Treat them the same way you would any other tender bulb - store in a cool place in barely-damp peat or some other medium that will retain moisture but not rot the bulb. 9. Deep pot, sunshine, water. For best growth in containers, choose a pot that is at least 10 inches tall. Although, like most plants, canna will grow in almost any type of soil, a rich humus soil is ideal. If you have lots of money and want to pamper them, plant them in African violet soil mix. They love warm temperatures and sunlight, and need at least six to eight hours daily. Soil should be kept moist but not soggy. Give them lots of organic fertilizer if you can. Although the commercial types will do. 10. What cut is unkindest? There are lots of opinions about pruning the flowers, but if your canna goes to seed and you want some new colour, cut the seed stem back to the nearest leaf. You can even cut a canna right back to the ground and it will rebound with fresh new leaves and flowers.